A clerical error has handed Ruling Dynasty (right) his second Queensland win in a week. An administrative error has allowed former promising Sydney stayer Ruling Dynasty win his second Queensland race in a week after he ended up in the wrong event. Ruling Dynasty ($4) charged home late to grab the favourite Sabkhat ($3,20) by a head with 1-1/2 lengths to AllKnight Saint ($19) third in the Bottle-O Handicap (1640m) at Doomben. Ruling Dynasty was a highly rated young stayer in Sydney for James Cummings where he won a City Tatts Cup and ran sixth in the ATC Australian Derby as a three year. After a stint on the Gold Coast, Ruling Dynasty was switched to Robert Heathcote at Eagle Farm and won his first start for the stable at Caloundra last week. 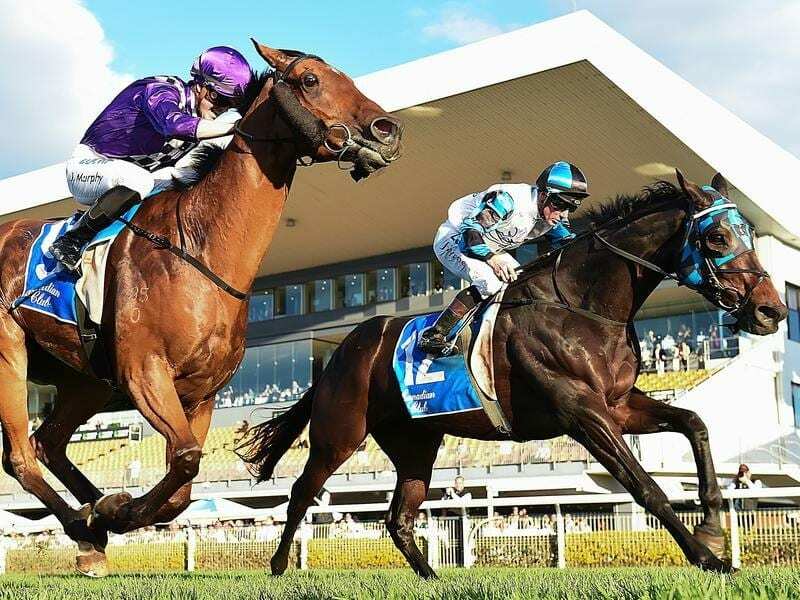 Heathcote said he had planned to run Ruling Dynasty in the 2000m race at Doomben on Saturday but due to a clerical error he ended up in the Open event. “The horse came to me very fit and we haven’t done much with him. Maybe that is the key just to keep him fresh,” Heathcote said. Meanwhile, trainer Tony Gollan had a quartet of winners in three different centres when Shesees Everything ($12) won the Chu The Phat Handicap (1050m). Gollan was in Rockhampton to see My Girl Hayley and Brains score while Trail of Glory won at the Gold Coast. Gollan’s stable foreman Holly Williams said Gollan had a big opinion of Shesees Everything who was headed for better things. “She was very unlucky in the Magic Millions Maiden before she won at Doomben and had a spell,” Williams said. Trainer Ben Currie had a two centre treble when Apoloboom ($6.50) won the Madame Wu Hcp (1200m) at Doomben after Pure Pulse and Shakira won at Rockhampton. Apoloboom was the first Brisbane winner for Melbourne apprentice Mitchell Aitken. “I got a call out of the blue to ride some horses today for Mr Currie and it has made the trip worthwhile,” Aitken said.